Valentine’s Day is coming up, and with Rosalind Creasy’s The Edible Flower Garden still on my mind, how could I resist sharing a romantic rose-cocktail made with real rose petals and homemade rose syrup? Long time readers may recall this recipe from nearly a decade ago, when The Gardener’s Eden was just getting started. Time to revive a long-standing favorite in the name of love and flowers! Although it’s easier to locate fresh, organic rose petals in June, many florists now offer organically grown flowers year round. 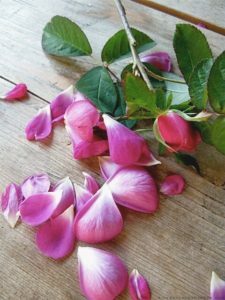 Request imperfect roses —or bags of fresh, organic rose petals— since you will be dismantling them. Be sure to ask for organic roses, making certain that no pesticides have been sprayed on your blossoms. Remember, you will be making syrup and sipping wine soaked in these petals! I make my own rose syrup for this recipe (best made 24 hours ahead, to steep). Some recipes simply use water, sugar and rose petals, however, I like to add food grade rose water and sprigs of French lavender, plus a few drops of organic red food coloring for a pretty pink hue. 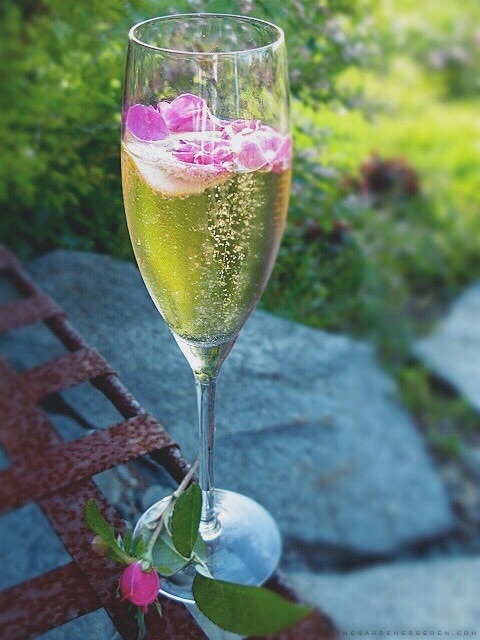 Add the rose syrup* to a chilled champagne flute. Top with sparkling wine or champagne. Twist the lemon peel over the glass to release the oils and then drop it into the flute. Garnish with fresh, organic rose petals. 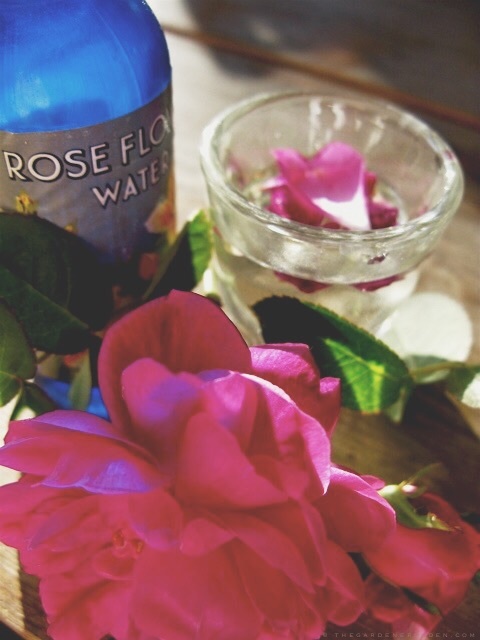 Mix water and rose flower water (if using) in a medium saucepan and bring the mixture to a slow boil. Immediately add the sugar, stirring constantly. Once the sugar has melted, reduce the heat to a simmer. Slowly stir in the rose petals and lavender. Stir for a few minutes to thicken. Remove saucepan from heat and allow to cool. You may add a couple of drops of organic red food coloring at this point, if you so desire. Pour the syrup mixture into a bowl with a tight fitting lid and allow to steep and cool overnight in the refrigerator. Remove lavender sprigs and seal the rose syrup in a small bottle. The syrup will keep fresh in the refrigerator for approximately 2 weeks. Freeze rose syrup for longer storage. Rose syrup can be used in many recipes —including cocktails, desserts and even main course entrees— so it’s very worth keeping some on hand, with your emergency stash of ice cream! To be a gardener is to suffer the occasional disappointment… the inevitable loss. The Cornus florida crushed by ice. The Acer palmatum girdled by rodents. On the other hand, nature will give as much as she takes. And often, her gifts come when least expected. Meet Bibi Maizoon. 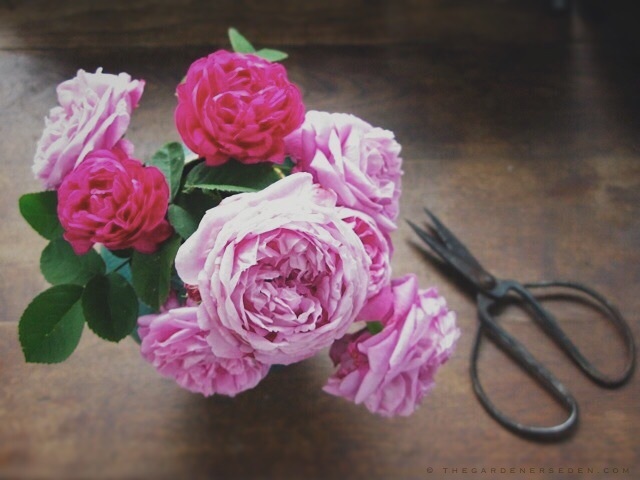 She is a David Austin English Rose. And just look at her! Look at that clear pink color. Oh how I wish computers could be click-and-sniff. 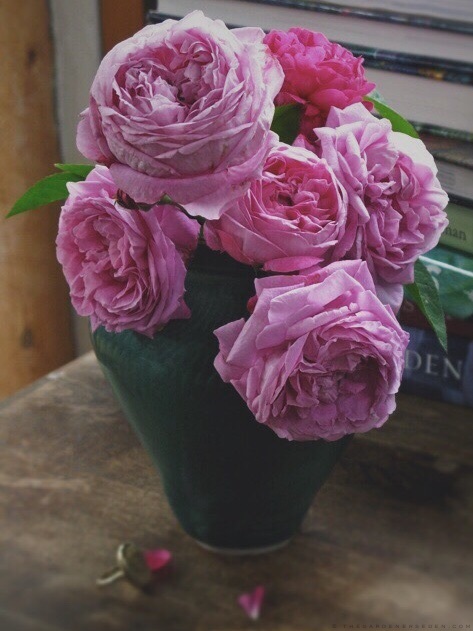 A classic, cabbage-shaped rose of magnificent size, (much like the antique Rosa centifolia), Bibi has a beautiful, full cup. In the early morning, when I spotted her bloom, the air was filled with a delicious, slightly spicy fragrance. Some have criticized her delicate neck, scorning the droop of her heavy-petalled flowers. I find such nit picking ridiculous. Perfection is very boring. True beauty draws you in with a hint of wildness; something subtly strange and untamable. I found Bibi cast aside in a late-season sale. Shocked by her voluptuous beauty, of course I fell in love. And in love we often throw caution to the wind. This is a marginally hardy rose, (pushing it at zone 5), and Ferncliff is a wild and rugged place, teetering on the edge of zone 4. But I was feeling bold and romantic, and against my better judgement, I snapped her up and drove home. I chose a protected spot just outside my secret garden wall, tucked her in for winter, and hoped for the best. Fast forward through one of the toughest winters anyone in New England can remember, and a summer so wet and dismal that I feared the appearance of webbed-toes on my feet. Well, here we are, at the edge of autumn. Nature is fast preparing for fall’s arrival. Days are shortened by lengthening afternoon shadows and clear, chilly nights are filled with millions of stars. I did not expect Bibi to bloom. I was happy she even survived. But you never know what will happen in the garden. We aren’t really in control. And isn’t that the most wonderful thing, after all? Choosing and siting a rose with it’s individual lifetime requirements in mind is wise for many reasons. 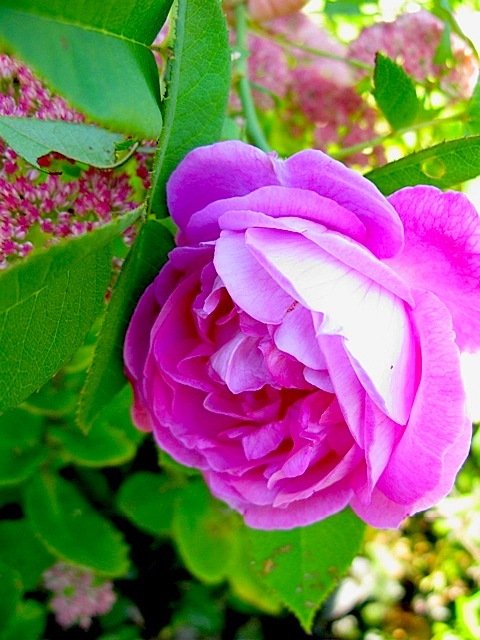 A rose planted in a proper site will receive ample sun, water, nutrients and protection. The site should also allow the rose enough space to reach its full size and shape, and provide ample air movement for healthy foliage and adequate drainage of soil for healthy roots. Focusing on the process of gardening, by providing a proper environment, is key to success no matter what the gardener wishes to grow. Soil is important to all plant life, of course. And roses, like most plants, have preferences about the soil in which they grow. It is wise to test your soil pH level, as well as nitrogen, phosphorus and potash levels, and adjust your soil chemistry accordingly. Roses prefer soil rich in minerals, nutrients and organic matter. Like most garden plants, roses prefer a slightly acid soil with a pH between 6 and 7. When soil pH becomes too low or too high, nutrients become less available to plants. A pH test is easy to do, and takes just a few minutes. Soil testing kits are readily available at most garden centers and through online vendors and more extensive soil tests can often be done through your local university extension service. Getting pH and nutrient levels right is the first step toward making sure that your roses are receiving what they need from the soil in order to grow and thrive. Soil texture is also very important to roses. And while it is true that roses prefer mineral-rich soil, it is also critical that they receive proper drainage and air circulation at their roots. For these reasons, it is often helpful to closely examine your garden soil, and modify the texture if necessary, before planting roses. Clay rich soils provide the minerals roses prefer, but unless organic matter, (such as compost and peat moss or other fiber), is added to the soil,the rose will rot and suffocate in water-logged, poorly aerated root conditions. Conversely, sandy soil will provide the rose with the drainage and dry roots it prefers, but the plant will suffer as minerals and nutrients wash away from the roots in quickly draining sand. Organic matter such as compost and other fibrous materials will hold moisture, minerals and nutrients in the soil, allowing the plant time to absorb them into it’s root system. Adding compost and other organic material will improve your soil, be it clay-like or sandy. Protecting the root zone of roses in climates like New England,where wildly fluctuating temperatures are common, will help prevent many problems. Compost-mulch shields roots and soil from heat and cold, weeds and insects, wind and erosion. Bare soil is not natural, and stresses plants. Caring for the parts of the rose beneath the ground is as important as the attention we give to the plant we see. The rewards of good soil-science are strong, healthy root systems and roses with access to good nutrition. a few inches of compost mulch, and perhaps the addition of herbal companion plants such as thyme and lavender, (herbs provide some natural insect resistance, and attract beneficial insects), will go a long way toward giving your rose ideal growing conditions. Of course, what goes on above soil level is equally important to rose-culture. Full sun is an absolute requirement for healthy roses. The plant should receive bright light from sunrise to sunset. Without full sun, a rose can not properly photosynthesize, and the result is a weak and spindly plant with few blossoms. Sunlight is also critical for dry foliage, and dry foliage is key to preventing fungal infections and disease. Although some rose varieties will tolerate less than a full day of sun, no rose is truly happy in shade. Sunny-sited roses will always be stronger and healthier than their shadowed neighbors. Give the rose what it needs, and it will return the favor of what you want: blossoms. Considering air circulation and flow is advantageous for plant health, and longevity. Siting your rose for unobstructed growth and air movement is important for disease prevention and cold protection. Roses protected from prevailing winds by taller trees and shrubs will grow stronger and avoid the damage of winter desiccation. So long as neighboring plants do not obstruct sunlight, roses will benefit from the back-up provided by neighboring hedges or groups of shrubs. It is also beneficial to plant roses on a slightly elevated portion of a site. Cold air flows downhill, and frost settles in lower parts of the land first. Siting roses in a raised position will help with both airflow and drainage, giving roses another advantage in a cold climate. Providing roses with the correct growing conditions is clearly important. 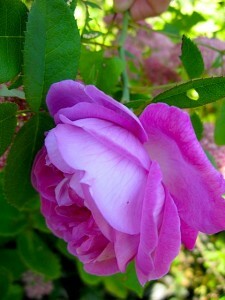 However, no amount of care and consideration can substitute for proper selection of the rose itself. When selecting roses for any garden, it is important to first consider the uniqueness of the plant. Every rose has an individual habit, mature size, shape and texture. Some roses are vigorous and shrubby, some are politely contained bushes. Certain roses are open-shaped, others are dense. A few roses may be grown as climbers or tall shrubs, others remain petite. Knowing the form of the plant will help the gardener decide if it is right for the garden’s design. Rugosa roses have very different requirements from English roses. And of course, any rose grown in a climate with cold winters must be fully compatible with the garden’s USDA hardiness zone. As most gardeners quickly become aware, even individual gardens can have micro-climates with enough temperature variation to make a major difference in cold-hardiness. Spots protected from prevailing winds and freeze-thaw conditions on an individual site may allow for some zone-flexibility. 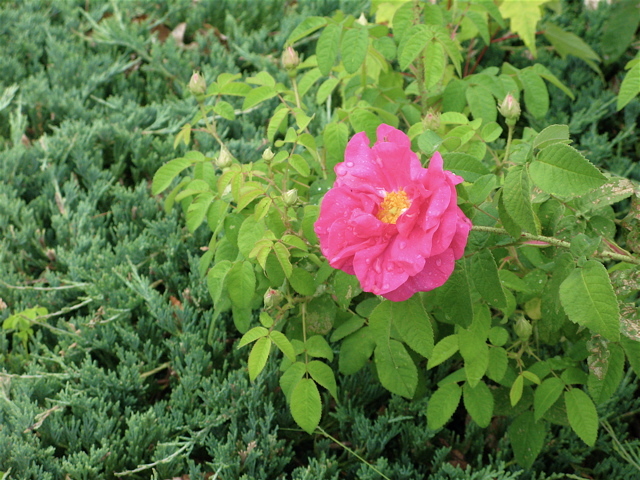 However, given the temperature variations in New England, it is safest to stick with a conservative attitude toward cold-hardiness, unless the gardener is willing to take extra precautions by mounding rose-root zones with compost each fall, and in some cases providing protection for the entire shrub. New rose varieties will be more variable than the tried and true, and for the beginning gardener, hardy and time-tested varieties are a good place to start. USDA zone 4/5 roses are a safe bet for most gardeners in New England, and zone 2/3 varieties will be safest for very cold, windy or exposed sites. Most rugosa roses, modern landscape roses, and many antique shrub roses are extremely cold hardy. Rosa rugosa “Sarah Van Fleet”, “Belle Poitevine” and “Blanc double de Coubert” and hybrid “Therese Bugnet” are beautiful, exceptional performers. Rugosas are a good choice for fences, hedges and groupings in the landscape. David Austin English roses are a nice choice for mixed borders, and provided the bud-union, (point of graft), is planted at least 4 inches beneath the soil-surface, a well sited Austin rose will perform well in New England. Tried and true landscape roses, such as “Carefree Wonder”,( and for small-bloom lovers, “The Fairy”), are excellent selections for a wide variety of perennial garden designs, including designs with stone and along walkways. For old rose lovers, the hardy gallica, alba, moss and damask hybrids are good bets. “Charles de Mills”, “Konigin Von Denmark”, “Karl Forster”, “Maiden’s Blush”, “Striped Moss” and “Stanwell Perpetual” bring some old European-style to northern rose gardens. In addition to the shrub and landscape roses mentioned above, some climbers such as “William Baffin”, “New Dawn” and “John Cabot” are tough enough to weather the cold winds and blistering sub- zero temperatures New England dishes out. Extra care must be taken when siting more marginal climbing roses, such as “Constance Spry”, in a cold climate. It is important to protect the exposed canes of more delicate climbing roses from desiccating winter winds. And always remember to position your rose to avoid damage from snow loads sliding off a steep roof. When purchasing potted roses, try to buy from a local nursery, where the growers know your zone hardiness and purchase or propagate roses with cold conditions in mind. Take the time to ask the garden center staff about the roses you buy, and research the variety online to learn its habits and preferences. Knowing your rose and giving it what it needs are key to success no matter the garden climate, however this advice holds particularly true for gardeners in the north, where roses named “cold hardy” will continue to smell sweet for many years. You are currently browsing entries tagged with Roses at The Gardener's Eden.